What is The Nature of Qi? 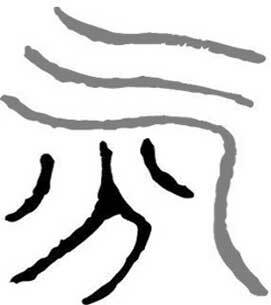 Qi character from the Zhou dynasty. Qi is the body's vital life force; it is the formless aspect of life which disappears at death. Often referred to simply as energy, Qi is really much more than our understanding of energy. It can also be perceived of as Light. The concept of Qi is fundamental to Chinese medical thinking. In fact, ordinary members of Chinese society know and understand the idea of Qi. There is, however, no English word, phrase or even idea that can adequately capture its meaning. Although we use the terms "vital life force" or "energy" to gain an impression of the Chinese perspective, it still does not fully convey the concept as the character for Qi would to a Chinese person (particularly one educated in classical Chinese). 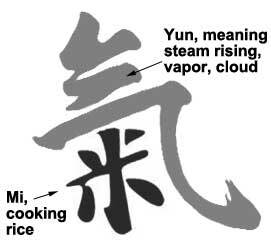 The character is made of two parts: one part is the character for rice, and the other reflects the notion of steam rising from cooked rice; this combination gives the imagery of something light, etheric and potent coming from nourishing food. The Chinese see everything in the universe, organic and inorganic, as being composed of and defined by Qi. Therefore, everything in the universe is seen to be the result of the movement and changes in Qi. As stated by Ted Kaptchuk in his book The Web That Has No Weaver, "Chinese thought does not distinguish between matter and energy…we can perhaps think of Qi as matter on the verge of becoming energy, or energy at the point of materializing." Thus, Qi just is and always has been. It is perceived by what it does, and how it functions. Yin-Yang* are expressions of the Qi of anything. So Qi is always seen as being composed of two polarities, continuously moving and adjusting to remain in balance with one another. *Yin-Yang like Qi cannot easily be explained, however if you think of positive and negative poles of a magnet or electric current you can gain an impression of what is understood by this term. Bear in mind that the original meaning of these words was Yin – the shady side of a mountain; Yang – the sunny side of a mountain; and these always change according to the position of the sun. This will give you some comprehension of the movement of Qi as well. Nothing is consistent; it can only be defined by its reference to something else. Now this last point is vitally important because it brings us into direct relationship with our own Qi-energy, and to the first most important rule or principle of Chinese medical philosophy, which is: Qi controls the body and mind controls the Qi. ^ This entry was originally published as "What is Qi?" on the author's website. It was slightly modified to fit the stylistic requirements of Qi Encyclopedia. ^ For the more recent treatment of this subject by Jerry Alan Johnson see The Secret Teachings of Chinese Energetic Medicine, Volume 1: Energetic Anatomy and Physiology; "The Five Energies of the Human Body and their Therapeutic Significance." International Institute of Medical Qigong, 2014.